Coin Digger is a simple game where you are digging for gold in a field and everything you manage to dig out is then converted to Bitcoins. You have 5 new pickaxes that allow you to dig 5 sectors of the field every 50 minutes, after that you can dig 5 more and get more rewards. You start at level 1 with 1 satoshi for a mined sector, then you get to level two where the reward is increased to 120 satoshi and so on until you find the gold. So the more you mine, the higher the reward gets and you can play the Coin Digger game absolutely free, no need to deposit anything to play it. The earlier you hit gold however, the higher the reward for the found gold is… with each next level and five more tries the reward for the gold decreases. There is an additional mini game called Gold Field where you can test your luck betting your coins and getting the chance to multiply your bet. It is a kind of minefield game where on each step there is one gangster that will kill you and the other three sectors will allow you to continue to the next level – the farther you go the higher the reward is, but you need to claim the multiplier before you are caught by a gangster. 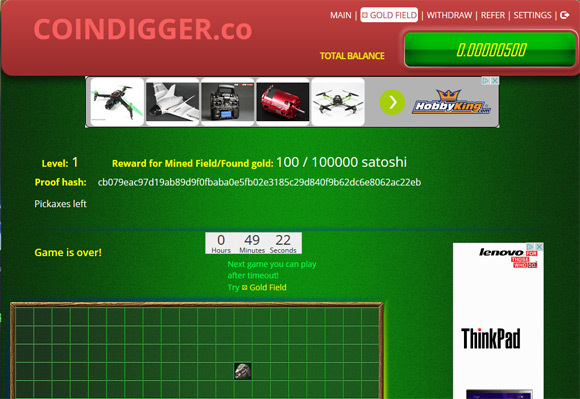 This mini game can be fun to spend some time while waiting for your next chance to play the mining game in 50 minutes. Payments of what you have managed to mine in terms of BTC are made once every Monday if you have at least 5900 satoshi in your balance.